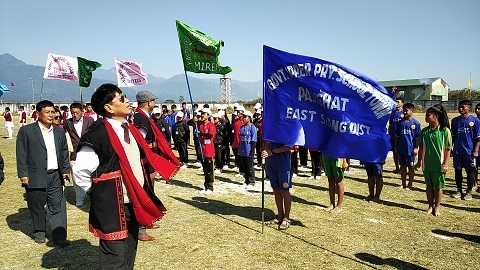 The district level games and sports meet of East Siang district of Arunachal Pradesh which is currently underway was declared opened by director of elementary education, Tapi Gao on Monday last in the presence of deputy director of School Education, East Siang, Jongge Yirang, Sainik School Niglok Principal, Lt Col G G Ashok and others. While speaking on the occasion, Tapi Gao appreciated initiative taken by East Siang DDSE Jongge Yirang and hoped that the other districts of the state will follow the system of East Siang by organizing sports meet for upper primary school level which gives ample chances to students to excel in sports instead of getting wasted or deviated toward drug and other bad habits. He further added that the state government is going to allocate more funds for sports to facilitate growth of sports in the state while following the Supreme Court ruling for granting funds for school in lower classes. While Sainik School principal Lt Col G G Ashok also spoke in favour of promoting sports among the lower classes which will keep the mind and body of a student healthy for any situation in future as sound body and mind is required to succeed in life. On his part, DDSE, Jongge Yirang who initiated and reintroduced sports meet in the school level by managing funds from his sources by approaching MLAs of respective blocks, said that, he is hopeful that students will get more real time benefits from the sports meet. The three days sports meet will end on January 26 in which a total of 12 sporting events are being held fright from football, kabaddi, kho-kho to relay race etc.